Most families with inherited pulmonary arterial hypertension — high pressure in the blood vessels leading from the heart to the lungs — have mutations in the gene BMPR2. But having a BMPR2 mutation doesn’t guarantee that an individual will suffer from pulmonary hypertension; only about 20 percent of mutation carriers develop the fatal disease. Now, Hamid and his colleagues have discovered a mechanism that may explain why only some mutation carriers develop pulmonary hypertension. The findings, reported in the Oct. 9 issue of Circulation, could lead to predictive diagnostic tools and new ways to treat the disease. 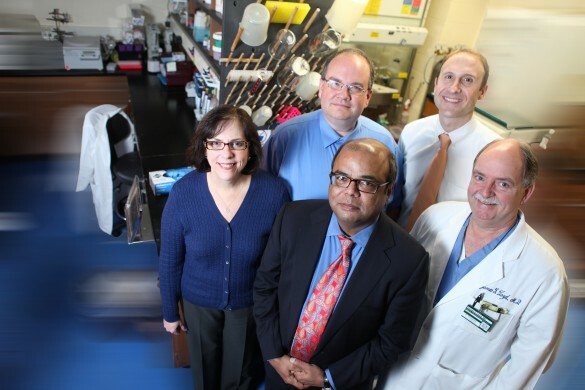 Vanderbilt researchers, including James Loyd, M.D., and John Newman, M.D., have been studying inherited pulmonary arterial hypertension since the early 1980s. They discovered that mutations in the BMPR2 gene increase risk for the disease, and they described the perplexing finding that the majority of mutation carriers do not develop the disease. In the current studies, the Vanderbilt team focused on a form of gene regulation called alternative splicing, which can produce multiple products from a single gene. In the case of BMPR2, alternative splicing results in two different products (isoforms): full-length BMPR2 (isoform A) and a smaller version of BMPR2 that is missing one section of the protein (isoform B). Hamid and colleagues studied cells from individuals with BMPR2 mutations who had pulmonary hypertension (47 patients) or were unaffected (35 subjects). They found that patients with disease had higher levels of BMPR2 isoform B relative to isoform A. “We could predict which patients had disease based on the amount of isoform B,” Hamid said. Previous studies have demonstrated that isoform B blocks the activity of normal BMPR2, which in the setting of a BMPR2 mutation could trigger disease, Hamid said. The findings suggest that testing isoform A and B levels may allow physicians to predict which mutation carriers will develop disease. These patients might benefit from closer follow-up or earlier initiation of treatments. “Maybe treatments that are already available for pulmonary hypertension, but that don’t work very well when the patient presents and has already lost almost all lung function, would work better if they were started earlier,” Hamid said. “It’s a paradigm shift in how we can think about pulmonary hypertension. Hamid and his colleagues are also excited by the possibility that the relative levels of BMPR2 isoforms may play a role in other non-inherited forms of pulmonary hypertension, such as the type that develops in some patients with sickle cell disease. In addition to showing altered BMPR2 isoform levels in patients with pulmonary hypertension, the researchers identified the molecular mechanism underlying the difference. They demonstrated that a certain splicing factor was responsible for producing the full-length isoform A, and that patients had lower levels of this particular factor. It might be possible, Hamid said, to use existing FDA-approved drugs to manipulate splicing and “shift the balance of the two BMPR2 isoforms in a more favorable direction.” If studies in mouse models demonstrate the feasibility of this approach, it can be rapidly moved into patient studies, he added. “What may seem like an obscure mechanism – gene splicing – may be almost immediately applied in a translational way to help patients, by devising tools to predict who will get disease and then possibly using new treatment regimens to prevent disease,” Hamid said. Hamid’s research colleagues included first author Joy Cogan, Ph.D., Eric Austin, M.D., Lora Hedges, Bethany Womack, James West, Ph.D., and James Loyd, M.D. The research was supported by a grant from the National Heart, Lung, and Blood Institute (HL102020) of the National Institutes of Health.